Intel’s sixth generation of CPUs, codenamed Skylake, have been around for a short while and it is about time that we take a quick look at them. I have an Intel Core i7-6700K in front of me which is their highest CPU available on the Z170 platform. It sports four cores and eight threads like its predecessors from Broadwell, Haswell and even dating back to the very first Bloomfield i7 CPUs. It would have been nice to see more cores being introduced, but that would make the enthusiast platform of X99 a bit pointless, so you can understand the logic behind this one. What changed from Haswell, to Broadwell, to Skylake? Well, there are a few notably different things such as the FIVR (Fully Integrated Voltage Regulators) being removed from the CPUs (thank you, Intel! ), the PCI-E M.2 slots being brought into full swing, and the shift to DDR4 are three that instantly spring to mind when I think of Skylake. With the removal of the FIVR, the CPU power delivery falls back into the hands of the motherboard, like every generation before Haswell/Devil’s Canyon/Broadwell. It results in lower temperatures and one less voltage to worry about when you’re overclocking, so it’s a win-win situation. DDR4 has its advantages with its increased throughput and its decreased operating voltage. In our testing today, you’ll see what kind of a difference it can make to the performance figures. Does it translate to increased performance in the real world? Yes, in some cases, and some very specific cases at that. From what you can see below, the CPU looks pretty much identical to everything that Intel have produced for the P** and Z*** platforms since time began for the LGA 115* platform. The Skylake chip is no different, except for the fact that the PCB is about half the thickness and the IHS is much thinner. As a result, the PCB does tend to suffer from bending when they have been de-lidded and are neglected afterwards. The increase of performance on a clock-to-clock basis is going to be rather small compared to Broadwell and Haswell, but that’s something we have become accustom to with Intel processors due to the lack of competition in the industry. However, any improvement is a good improvement, and I welcome that for obvious reasons – backtracking is not something we look for in a product. 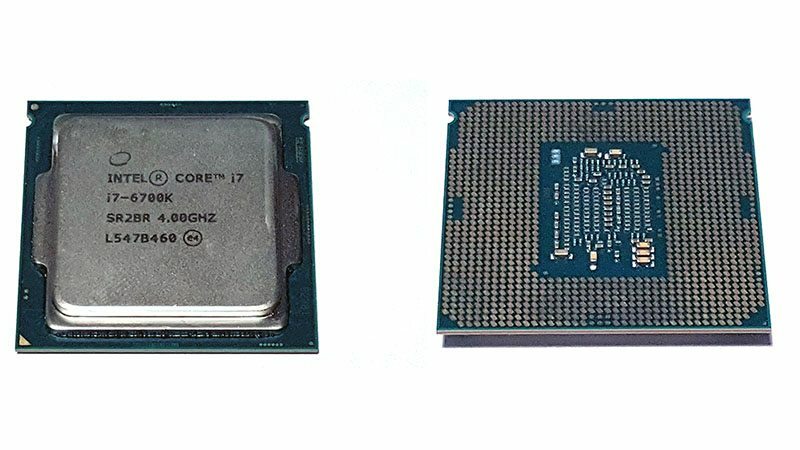 Below we can see a die shot of the 6700K, which consists largely of the graphics chip and four cores. Of course we have the on-board memory controller (IMC – Integrated Memory Controller) present as well as various other things which used to be built into the North Bridge many moons ago, such as the I/O and SA (System Agent) controllers. It’s crammed to the brim, as you can clearly see. There’s not a micron that goes to waste here. • Five 4.5W Intel Core Y-series processors for small-screen 2 in 1 detachables and 2 in 1 convertibles. • Ten 15W and four 28W Intel Core U-series processors for 2 in 1 convertibles and ultra-thin clamshells. • Six 45W Intel Core H-series processors for thin clamshells and large-screen notebooks. • One 45W Intel Core H-series unlocked mobile K SKU for enthusiast notebooks. • Two 45W Intel Xeon processors for mobile workstations. • Ten 65W and eight 35W Intel Core S-series processors for gaming towers, stationary All-in-Ones, and mini PCs. • Two 91W desktop Intel Core S-series processors for overclockers and gaming enthusiasts. Today, we are taking a look at their 91W desktop CPU which is aimed at gamers and enthusiasts. I know there’s plenty of argument on the internet about the whole i5 vs i7 ordeal, but for those who want to splurge the cash and have the i7 badge on their case, or even for a little E-peen, the next-gen i7 6700K may be the one for you. The graphics chip that comes on-board the latest Skylake CPUs is not as powerful as the one which you would find on Broadwell, but it still packs an awesome punch considering that the vast majority of users whom are intending to get Skylake will not be using the iGPU. Personally, I’d like to see a chip with it removed, but I doubt that’s ever going to happen (it did on the Sandy Bridge CPUs; remember the 2550K?). It is codenamed the Intel HD 530, which seems an odd direction to take when all of the previous generations went up with their respective generation of CPU, such as the HD 2000 on Sandy Bridge and so on and so forth. Of course, that logic doesn’t follow one hundred per cent, but it is a good guide to go by. We all know it is just a naming scheme, but it would have been nice to see them follow through with it. The only reason I suspect it has changed is due to the Iris Pro code names, which are in the 6000 range, and are therefore impeding on the Skylake naming structure. 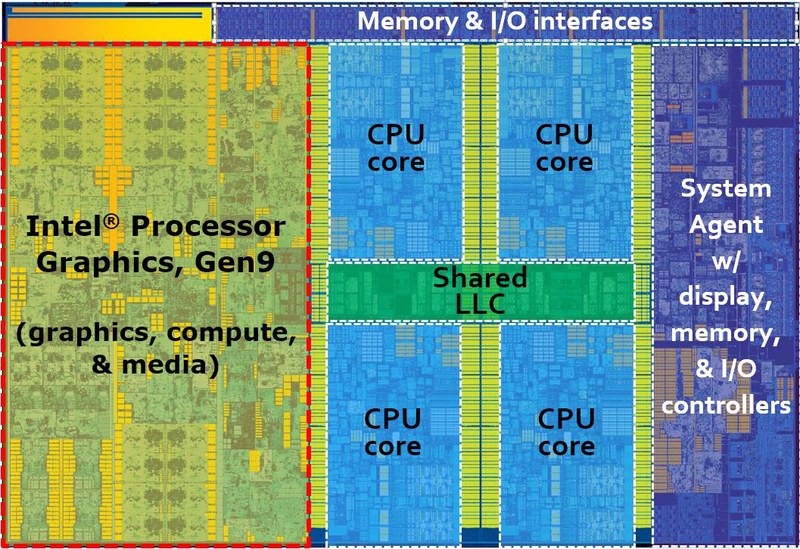 Let’s take a look at the specs of this latest and greatest chip from Intel before we check out what it can do against its Haswell and Broadwell counterparts.